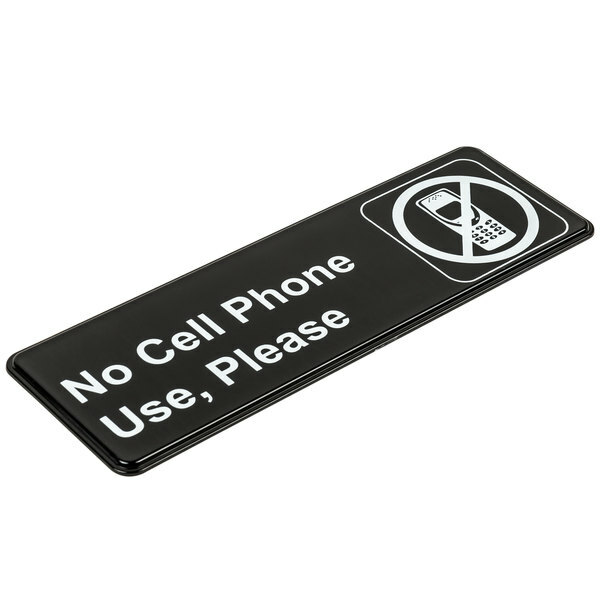 No Cell Phone Use, Please Sign - Black and White, 9" x 3"
Conveniently inform your customers of the cell phone policy within your theater, dining room, spa, or healthcare facility with this 9" x 3" no cell phone use, please sign. Featuring a black background with bold white lettering, this sign's message is easy to read. For those who may have trouble reading, a symbol is posted to the side. With a self-adhesive backing, this sign can easily be mounted anywhere you seem fit. 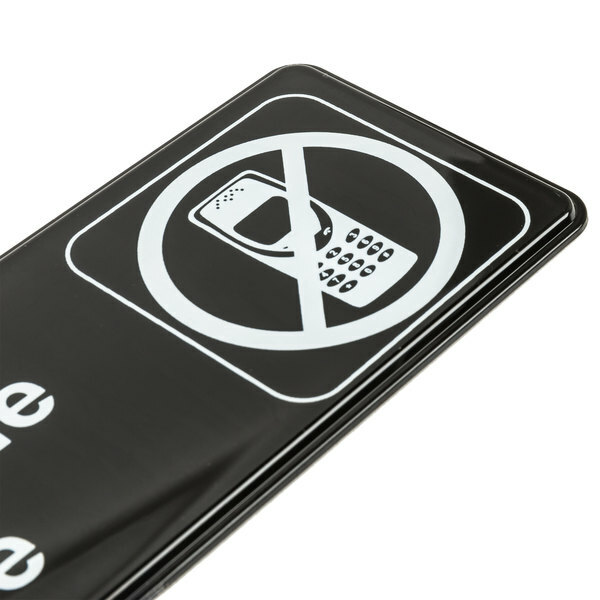 This lightweight plastic sign is also easy to clean and transport, which makes placement effortless. By hanging this durable sign, you can give your guests everything they need to know up front and keep them happy! No Food Or Drink Sign - Black and White, 9" x 3"
No Admittance Sign - Black and White, 9" x 3"
No Soliciting Sign - Black and White, 9" x 3"
Not Responsible for Lost or Stolen Articles Sign - Black and White, 9" x 3"
Thank You For Not Smoking Sign - Black and White, 9" x 3"
Exit Sign - Red and White, 9" x 3"
No Exit Sign - Black and White, 9" x 3"
We Are Pleased To Provide All Our Guests A Smoke-Free Environment Sign - Black and White, 9" x 6"
Private Sign - Black and White, 9" x 3"
No Smoking Area Sign - Red and White, 9" x 6"
Caution, Watch Your Step Sign - Black and White, 9" x 3"
Office Sign - Black and White, 9" x 3"
Overall User Rating: No Cell Phone Use, Please Sign - Black and White, 9" x 3"
This sign is super easy to install and has a clear, concise message. 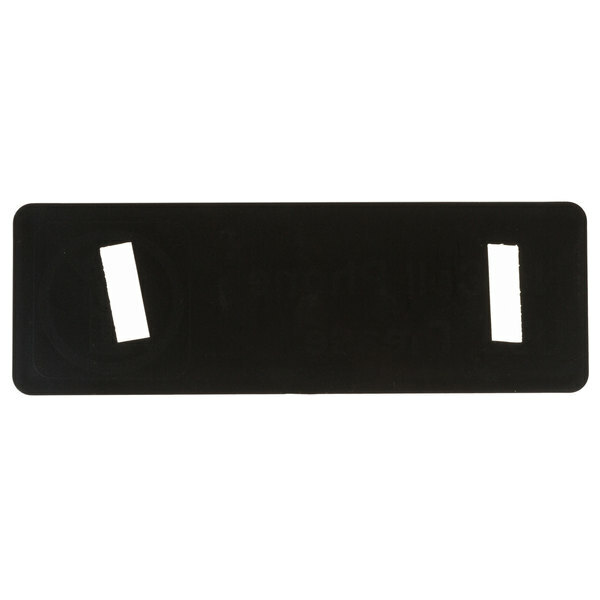 It comes with a self-adhesive backing and takes less than 10 seconds to stick to the wall. I appreciate the sign's politeness – including the word "Please" is a friendly, effective touch. With everyone carrying and using a cell phone these days some people do not want cell phones to be used in their place of business. 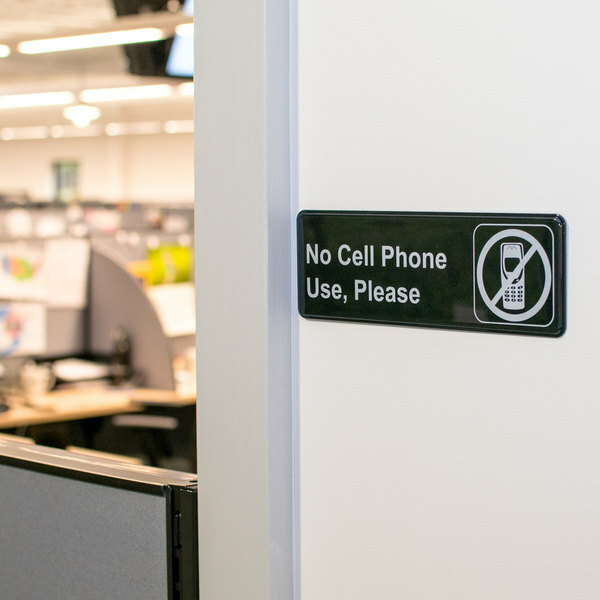 If cell phones are not permitted in areas within your business this is a sign you may want to have. 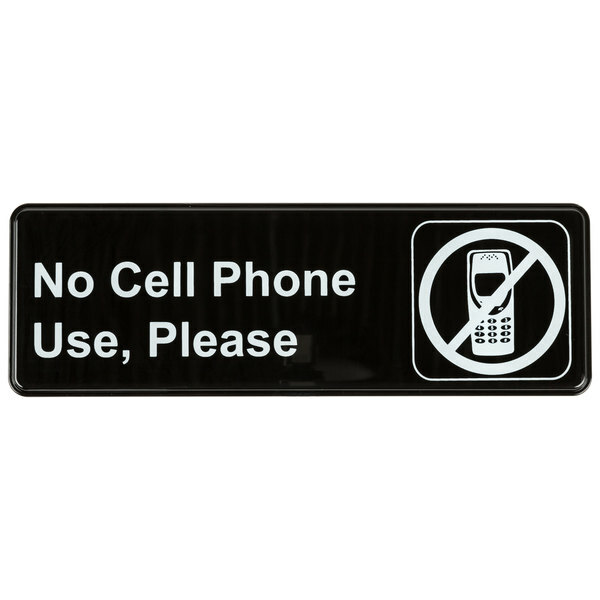 This sign makes guess aware that cell phones are not allowed in the area. The black background and white text makes the signed very easy to read. The sign and also features a graphic with a cell phone and a X through it. A great and simple sign. The sign has a nice sturdy construction. The message and picture are easy to understand. I would recommend this as an official sign. I have been pleased with this nine inch by three inch black and white no cell phone use, please sign. I would recommend and would definitely order again in the future because it arrived earlier than expected and is much heavier than expected. The sign was dropped several times and has shown no sign of wear and tear. Not good quality. Broke within a few days of having put up due to the adhesive backing failing. Do not recommend. Would rather have the sign in metal. Thank you for the review Larry. We’re sorry this has not worked well for you. For an alternative that might better meet your needs, please reach out to our Customer Solutions Team! I got sick of telling people to put there phones away while at work so i just posted these all other the restaurant. Not that people listen, but i have had to say put your phone away a lit less now. Nice and cheap too! This sign is ridiculously easy to set up thanks to the adhesive back. And it's easy to read thanks to the large clear lettering. Worth buying. Make sure employees are following your standards. I like to make sure no customers are ignored because an employee is in their phone. This sign makes that clear. Just like it shows. We are really hoping this will help to keep employee cell phones out of the kitchen area. Looks and feels high quality. This is perfect for our busy kitchen. Too many times have I need people peeking at their phones, which are not sanitary, and dsitracting them from getting on the next task. This is a great sign for a business. Cell phones can be very annoying in the dinning room. This sign lets your customers to please refrain.